Acne can leave scars on the skin which can be treated in a number of ways, including the use of dermal filler. In this article we will discuss treatment options for treating acne scarring. At Cityskin we only offer dermal filler for treating scars. This isn’t suitable for all patients so please have a thorough read of the article to see if dermal filler is right for you. As Doctors, we recommend always making sure that you have active acne treated. We see little point in treating scarring until you have stopped new acne lesions from forming as these can also scar. See your GP or dermatologist for advice on how to stop acne, or read our acne treatment guide. If you have fine, superficial scarring on the face then there are a number of modalities available to help reduce their appearance. A series of chemical peels can help reduce the depth and appearance of scars. Lasers such as Fraxel are fantastic at reducing scar appearance but you have to bear in mind that you are likely to need 4 – 5 treatments over a period of months. Deeper scars, such as those in the picture above, can again be treated with laser, chemical peels and dermal filler. Laser treatment for deep scars includes fractional laser such as Fraxel and ablative lasers such as CO2. A series of treatments is often needed to reduce the appearance of the scars and the treatment is likely to improve rather than fully eliminate all the scars. ‘Ice pick scars’, shown in the image, can be treated with a strong solution called trichloroacetic acid (TCA) which causes inflammation and subsequent collagen stimulation. Dermal filler can be injected under the skin of the ice-pick scar to reduce the depth of the crater and improve the overall appearance. Dermal filler can be used to temporarily fill pitted acne scars. However, they may not “completely” disappear. Treatment can also induce collagen formation to help with reducing scarring in the long term. Think of this as the icing on the cake rather than the treatment that will make the largest impact. Results will vary depending on the severity of the scar, how long it has been there and other underlying factors. Dermal filler can also be used in conjunction with other modalities, such as; subcision with a needle, skin needling, fractional laser, and other skin resurfacing treatments. 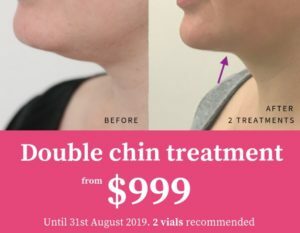 How much does dermal filler cost for treating scars? We charge from $650 for 1ml of dermal filler depending on the filler used and the clinic you attend. We do not charge a consultation fee. How long does dermal filler last when treating acne scarring? Dermal filler tends to last 6-12 months when treating acne scars. This can vary in individuals and dependent on the filler used. 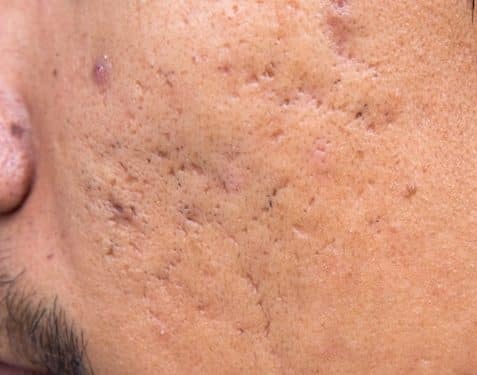 Is acne scar treatment painful? We often numb the skin before treatment with lignocaine anaesthetic cream. The treatment feels like a sting and is generally less painful than patients expect.